What's Causing Burnout Among Neurologists in Private Practice? Having just returned from the AAN regional conference in Las Vegas, I can definitely attest to the stress impacting neurologists in private practice across the nation. Among causes, insurance denials top the list, but keeping up with regulatory issues, avoiding Medicare penalties, the threat of RAC audits, and the cost of running a practice were also on attendees' minds. That was the case for Deborah R. Syna, MD, who has worked as a solo neurologist in Portland, OR, for the past 18 years. Two weeks ago, Allscripts, her electronic health records (EHR) vendor, announced that it would no longer support meaningful use Stage 2 requirements and beyond for its “MyWay” product. Although they offered a free upgrade to their “PRO” software, financial transactions, practice management reporting data, insurance claim history, clinical decision support notes, health maintenance rules, and clinical templates which she had created will not be migrated to the new EHR. Patient data will not be lost but will be converted into text format requiring her to re-key many sections of the EHR. “If I want to continue to meet meaningful use criteria and avoid penalties I need to convert to a new EHR incurring costs which cannot be understated, including increasing staff to accommodate for the time,” she said. Dr. Syna's practice viability is also challenged by insurance company requirements for more and more pre-authorization for testing and prescriptions (even generics), and the slow-down of reimbursement due to medical edits for complex procedures and the use of biologicals. “Formularies are more restrictive, and there are more hoops to jump through to get patients the testing they need,” she explained. Moreover, Medicaid in her area has become more restrictive due to state budget shortfalls. “The fundamental war these days is between the payers (private and government alike) and the pharmaceutical companies; the patients and physicians (oops, health care providers) are caught in the crossfire,” he said. Dr. Freedman estimates that he signs up to 20 prior authorizations a day. With 25 neurologists in his group this becomes both expensive and frustrating, he said. “We physicians are doing our part in trying to control health care costs by going electronic but we are being hamstrung by the insurance industry which does not want to pay for anything and by the pharmaceutical manufacturers who overcharge on everything,” Dr. Freedman concluded. • From Neurology Today's archive: The Demise of Private Practice Neurology: Death by a Thousand Cuts: http://bit.ly/drFzbu; More Death By A Thousand Cuts: Neurology in the Crosshairs as CMS Seeks to Slash Reimbursement for ‘Bread and Butter’ Codes: http://bit.ly/QPQudV. 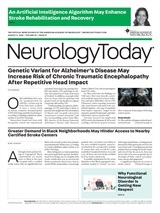 Neurology Today12(22):29, November 15, 2012.